Follow us on Facebook to keep up to date with our news and newest resources! ©2007-2019 The Institute for Christian Formation, Inc. All rights reserved. On January 2nd the Church celebrates the Memorial of Saints Basil the Great and Gregory Nazianzen, who were Bishops and Doctors of the Church. These men lived in the fourth century. They were both born in the year 329 in Cappadocia, in what is now the country of Turkey, and as students they became friends. Basil decided he wanted to become a monk. 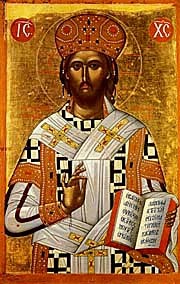 He founded the first monastery in Asia Minor, and eventually became the archbishop of Caesarea. He was committed to helping the less fortunate. He founded a hospice, cared for the sick, and helped those who suffered hunger as a result of droughts and famine. He was a famous preacher, and challenged his flock to care for others and help the poor. He is considered one of the great teachers of the Church. Basil died on January 1, 379. 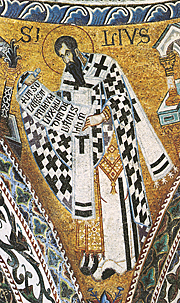 Gregory also became a bishop, and eventually became the Patriarch of Constantinople. He had a great love and knowledge of Scripture, and was known as both a preacher and a writer. Gregory died on January 25 in the year 389 or 390. Basil and Gregory are celebrated as Saints by both the Eastern and Western Church. It is fitting that their feast day is celebrated during the Christmas Season, as Saint Basil, especially, has a long standing feast day tradition in the Eastern Church. the person who receives the piece of bread with the coin is said to be blessed with good fortune for the upcoming year. Watch the video below to learn more. You can find out even more about the Vasilopita tradition, as well as find a recipe for the Vasilopita here. I purchased my Vasilopita coins, with the image of Saint Basil, for my vasilopita from the Greek Orthodox Department of Religious Education, 1-800-566-1088. Item FL850, the Vasilopita coin came with the story of the Vasilopita, a recipe, as well as traditional cutting instructions. This is a very easy tradition to adapt and incorporate into our Roman Catholic celebration of the Christmas Season and the January 2nd Feast Day of Saints Basil the Great and Gregory Nazianzen. 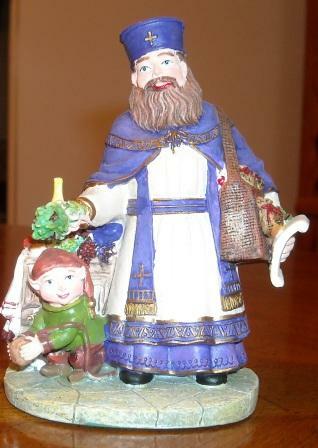 Several years ago I was at a January end of season sale at a local department store, when I saw a table of figurines from “The International Santa Clause Collection.” Among the figurines on the table was one of St. Basil, which I purchased. The story on the side of the box in which the figurine came told the story of St. Basil’s Day in Cyprus, and how on this day (January 1 in the Orthodox tradition), or its eve, St. Basil is the gift giver who visits every home. The home’s residents were expected to leave a food offering out for St. Basil’s visit. While I don’t think these figurines are in production any more, you can still find some of them on E-Bay.